The World Methodist Council invites you to submit a proposal for event management services, as per the below-linked Scope of Work/Terms of Reference (TOR). The World Methodist Council, in partnership with the host church (Uniting Church in Sweden), is planning the organization of the 22nd World Methodist Conference in Gothenburg, Sweden, to take place from 18-21 August 2021. The Conference takes place every 5 years. Get a brief primer on what you need to know before arriving at the World Methodist Conference! Houston, Texas USA – This month, over 2,500 people will gather at the Hilton Americas – Houston to participate in the World Methodist Conference and various pre-events. Get to know a little more about OneWMC2016 in our Alphabetical rundown! A is for Airports … the majority of attendees will be flying into one of two Houston airports (George Bush Intercontinental or William P. Hobby) where they will be greeted by friendly volunteers! B is for Bags that attendees will receive if they come through the airport, and everyone receives a bag when they arrive at the event registration on level 4 of the Hilton Americas. C is for Cokesbury … They’ll have books from presenters, workshop leaders, and others as well as various other items in Ballroom of the Americas D on level 2. D is for Download video on demand after the event, just in case you missed something! E is for Exhibits on Levels 2 and 4. Visit the sponsor booths on level 4 outside the Grand Ballroom, and our vendors and displays on level 2 in the common space. F is for Friends which we hope you will meet old and make new! G is for Gungor, a contemporary Christian Band, which will be a part of the Texas Cultural evening on Friday beginning at 7 pm in the Grand Ballroom. H is for Houston … One of the most diverse cities in the country is hosing us for this year’s Conference. I is for Ice Cream which will be served following the Saturday evening closing worship! J is for Justice, a topic of several of our workshops on Friday and Saturday! K is for Kingdom Building with your brothers and sisters from around the world! L is for Love … we all need more of it! M is for Music … You’ll hear lots of it, from all over the world! N is for News sent daily by email. Sign up here. O is for ONE … One God, One Faith, One People, One Mission – let’s explore what makes us One in the body of Christ! P is for Prayer … pray for the Conference and be prayed for AT the Conference (Prayer room will be in room 430). Q is for Queries which you can have answered at our Information Booth on Level 4! R is for Recognition … We’ll be recognizing the World Methodist Peace Award recipient on Saturday, 3 September. S is for Social … We want you to share your experience with others while you’re at the World Methodist Conference! We hope it’s all good! 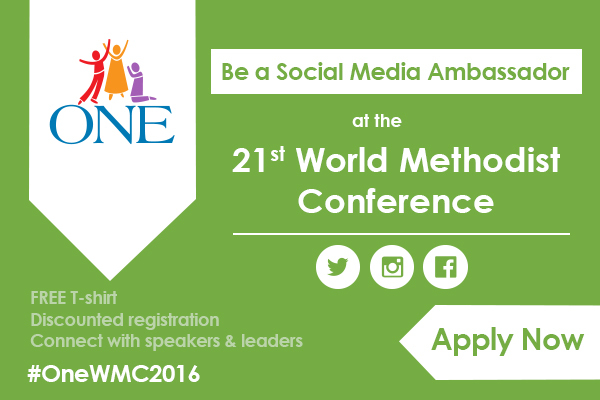 Mention us on Facebook (@World Methodist Council), Twitter (@WMCouncil), Instagram, or Flickr or by using the hashtag #OneWMC2016. T is for Tea … We will, in fact, serve tea at refreshment breaks (but not the native Texas variety that involves ice and loads of sugar!). So, no need to pack your kettle in your carry-on. U is for Unity … That’s what we’ll be exploring during our time together – what makes us UNIFIED, without being uniform. V is for Vendors … Vendors and displays will be on level 2 in the concourse facing Discovery Green. Check out what greats items are on offer from around the world! X is for eXciting worship, workshops and fellowship during the Conference! Y is for Young People … The International Methodist Young Leaders Seminar (IMYLS) will be meeting just prior to the Conference on Wednesday! A special thanks to The UMC General Board of Global Ministries and Young People’s Ministries for their support of this important gathering! Z is for Zip … Zip your bag and get to Houston! Do you want to connect with other Methodists, Wesleyans, Nazarenes, Uniting and United Church members from around the globe? Are you social media saavy? Then you might be our next Social Media Ambassador! What does a SMA do? Come to the event and share your experience! You can hear from many of our Conference speakers and leaders on YouTube! Go there now to hear from your favorite speaker, workshop leader or worship leader! We’ll be releasing each of these videos on our various social media outlets in the weeks leading up to the Conference. Be sure to share with your friends and colleagues. And if you haven’t already registered for the World Methodist Conference, what are you waiting for? Space is filling up, so register now, and don’t forget to make your reservations at the Hilton Americas – Houston! Bishop João Carlos Lopes, Bishop in the Methodist Church in Brazil will be the Bible Study Leader on Thursday, Sept. 2, at the 2016 World Methodist Conference. You can read Bishop Lopes’ bio at http://worldmethodistconference.com/speakers/joao-carlos-lopes/. Below is a video of his message at 2013 Aldersgate. Article from Expositor Cristão (January 2016). It is Jesus who edifies the church: He said “I will build.” No one — Pastor or charismatic leader, the skilled or the talented can build the Church. Sometimes we are impressed with some leaders. We should be impressed with Jesus. It is he who builds the Church. pointing to the future. It is not something that happened in the past. It’s something that keeps happening, and will continue until He returns. The Church belongs to Jesus: He said “my church.” So if we say “mine” or “your own,” then it is not Church. If Church, it belongs to Jesus. Remember it was Jesus who died for the Church, it was not you or me! Jesus always protect the Church: Jesus protects a church not in the passive sense, but in the active sense. The church moves, and the power of Jesus attacking the door to Hell (the manifestations of evil), and the gates of hell shall not prevail. So we do not have to be afraid of performing the Lord’s work. He takes care of His Church. We need to commit to a life of prayer: We need to take practical steps to become more effective as a praying church. We need to come together to pray. In Matthew 21:13, Jesus said “My house shall be called a praying House”. Certainly We pray individually, but we need to pray corporately also. More than a program, prayer needs become a lifestyle of the Church. Prayer must again be a priority in the life of the church. We can not forget that “it is not by might, nor by power, but the spirit of the Lord ” (Zechariah 4.6). We need to commit to a life of Holiness: This is the commitment of the people called Methodist from their origins going back to Wesley, and its preachers reached the conclusion that those Methodists had been called to “reform the nation, especially the church, and spread Biblical holiness throughout the land.” Our history speaks about holiness. Our national planning talks about holiness. Our theme for the biennium brings this emphasis: “Disciples and disciples in Mission paths, produce fruits of a holy life.” Everyone produces some kind of fruit. We are called to bear fruit that testifies to the fact that we have been blessed and set apart by our God. People bearing holy witness through a life in the presence of God. We need to commit to a lifestyle of generosity: Generosity is always the consequence of love. Those who really love are generous. God so loved us that He practiced the greatest act of generosity, giving his only son. Generosity affects all areas of our life: finance, gifts, talents, time. When we plant a new church or a new mission field, it is an act of generosity. A sacrificial act of love – We go out of our comfort zone to bless other people. when we hold a mission. This is an act of generosity and love. When we accept to lead a discipleship group, a class Sunday school, this is an act of generosity. When, in obedience to the Lord, we use our gifts and talents in the church service and community, it is an act of love and generosity. In the Christian life, the lack of generosity is synonymous not only with selfishness, but also synonymous with disobedience and infidelity. Lastly we need to commit to excellence in all that we do: It is not enough to be generous. IT IS A must to do everything with excellence. After talking about the gifts in chapter 12 of the first Epistle to the Corinthians, Paul begins Chapter 13 saying in use of the gifts, I’ll show you the most excellent way — “love.” Everything we do with love, we make quality and excellent. I said Jesus has a project for your church. His project is to make disciples of all nations. Thus the Methodist people progress, participating in the project Jesus for his Church. Go Forth in Prayer: HOLINESS, GENEROSITY AND EXCELLENCE. God help us and give us grace! What is the World Methodist Council? The World Methodist Council is a worldwide association of 80 Methodist, Wesleyan and related Uniting and United Churches representing over 80.5 million people. The 21st World Methodist Conference will meet in Houston, TX, on August 31-September 3, 2016. As chair of the program committee, I am writing to extend our heartfelt invitation for you to join us. Our team has worked for months to design an event that motivates conference participants to change the world, and we believe that your presence will be a key to our success. As you can see in the logo, the theme for the conference is “One.” Organized around four subthemes – One God, One Faith, One People, One Mission – the program will invite participants into a conversation about the distinction between unity and uniformity in the Wesleyan tradition. We want participants to leave Houston knowing what has united the Wesleyan people historically and what God is calling us toward in the future. The conference will begin with an evening celebration of the triune God and conclude with another evening celebration three days later that sends us out into the world as a diverse body of Christ followers. In preparation for the conference, you will want to take note of the information included on this website. As an entrée into our global conversation, for instance, please review the theological guidelines posted here. They will serve as the primary point of reference for all presenters and participants in the conference. And please check this website periodically. It will host all pertinent information for the conference and will be updated as the event approaches. We are hard at work in preparation for what looks to be an historic event, and we covet your prayers. The grace of God abounds. Please plan to join the celebration!